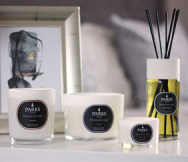 Parks Candles’ Jug Massage Candle range was specially created to ensure it is both safe and stimulating when used in contact with the skin, and as part of several different massage practices. Not only does it use a unique blend of waxes that are noted for their purity and low melting point, it also offers an easy pouring spout to make sure it can be applied carefully and precisely without scalding the skin. The wick is, of course, our own smokeless, soot-free 100% pure cotton variety and is equally suitable for burning traditionally and massage. However, its unusually heavy gauge encourages the rapid melting of the wax and fast distribution of its scent. Like all of the other handmade candles our expert craftspersons make, our Stimulating Massage Candles are considered to be ‘aromatherapy grade’. This means that each ingredient is not just responsibly sourced, it is also harvested, processed and stored in ways that support their use the best, producing scents of unrivalled purity and potency, even after years of storage. The scent we call ‘Stimulating’ is exactly that. It is a proprietary blend of natural essential oils, aromatic resins and other naturally derived perfumes, each chosen for their ability to stimulate the mind and body in different ways. Some provide a sensuous, enticing scent while others are said to enliven the mind or even awaken the body on a physical level. The combination works to ensure a lively time on all levels, even if the scent is enjoyed alone or outside of the context of massage. All of our Massage Candles are supplied in a decorative storage canister.